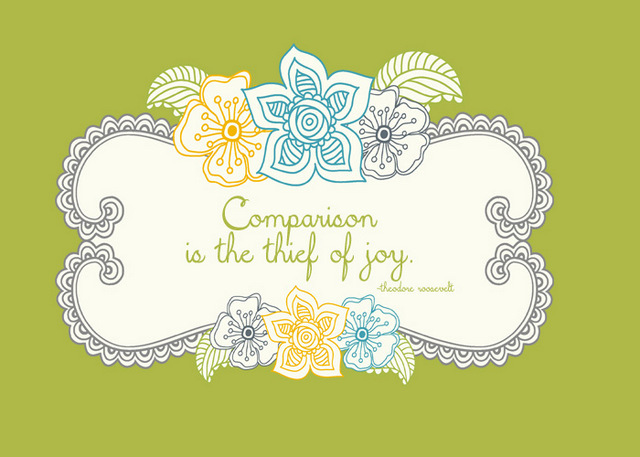 Comparison - The Thief of Joy. My head was buzzing with these words the moment I woke. As of late, I have been incredibly thankful for the opportunities the Lord has put in our path. A dream since childhood that has "blossomed" as a result of a simple facebook post, a job in the creative arts that every day I adore more and more, a husband pursuing his dreams in the therapy realm...and yet lately I have found myself putting so many others on a pedestal...dreaming to be more like those around me both in life and in the online sphere that I look up to so, so dearly. And then I catch myself...putting myself down. Telling myself once again I am not good enough and forgetting all too quickly that this thief that comes in the night is trying to take the pure JOY that my Father in heaven so badly wants to offer my soul. I am WILLINGLY putting all that my heart and soul have been filled with out on the table, begging for it to be taken from me. Allowing it to rip joy from my heart and in return this thief will only ever break my heart, splashing tears onto my face and thrusting a deep ache into my soul. But I desperately don't want to let this THIEF win. No, I CAN'T let it win! Not if I am to accomplish all that I was put on this earth to do. I crave with all of my being to live my life for HIM and love others. The depths of my soul surges with a desire to encourage those around me to be ALL that they were created to be...living every day with zest and to not spend the time that I do, dwelling on what I lack and my deep seeded insecurities. I simply cannot be of any help to a single soul if I continue to let this thief win. Not if I willingly stand back and watch my incredibly thankful heart, that is filled with pure joy be ripped up right in from of me and stomped upon. So I get on my knees and plead to Him to heal me of this. As imperfect flesh, I know this is something I will likely always struggle with, but I also know HE CAN and WILL give me the tools to over come this if my heart is open and willing to accept HIS GRACE and make a conscious effort to stop these evil thoughts. Instead of comparing, I am determined to love myself more. Embracing that I was made with a PURPOSE. Yes, I am a tiny soul in this incomprehensibly gigantic world, but He loves me with all the He has, and I refuse to let Him down by letting my thoughts overcome me. I want to continue to celebrate the gifts that others have been given, and strive with all my being to stop instantly turning around and looking at all of the places that I fall short every single day.